Pancakes, I'm sure, are ingrained in all our childhood memories. Comforting times for the lucky! I have similar, warm memories of wide-eyed expectation, sitting at the kitchen table waiting for my moist pancake, made juicy with a little sugar and a squeeze of lemon. Wow!! This was one of the first things I learn't how to make - batter!!! For me a good pancake has a little thickness to it, at least 3mm. With a light, moist texture so that it rolls up into a proper pancake. A pancake that oozes tasty juices onto your tongue as you bite into it!! It should have a lovely golden colour and not look all pasty and anaemic, and it should definitely not be rubbery! What is it with pancakes? The first one always seems to go a bit wrong? Maybe something to do with judging the amount required for whatever mad batter mix has been concocted on the fly this time round!! 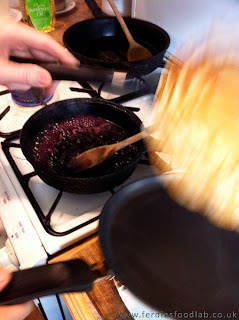 Here's how to make classic and Snowburst pancakes . . .
OK, to get a light, moist pancake we want a bubbly mix, for which we need a little yeast: Warm the milk up to around 35C / 95F, and mix in the yeast until it's completely dissolved. Don't use milk hotter than 50C / 122F since that will kill the yeast. Add the egg, sugar and salt to a whisking bowl, sieve the flour and add the yeast mix, whisk until smooth. To avoid rubberiness, we want little egg, and we want to avoid gluten formation, so stop whisking as soon as you have a smooth mix!!! Packed with tiny bubbles for extra lightness! Leave the mix on the counter for at least 30 minutes until it has small (half mm) bubbles running through it and has a ribbon consistency. Ready to rock!! It's pancake time!! Add a small knob of butter to a hot pan, let it melt, then coat the surface with it. Pour the batter into the centre until the circle of batter is about 2/3's the diameter of the pan. That should be enough to make a pancake the size of the pan, move the pan to coat the bottom completely and wait for small holes to form around the edges - then toss the pancake. 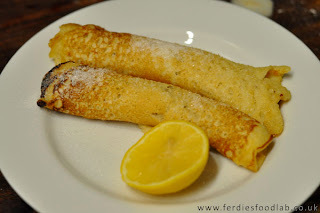 Classic pancakes - simplicity - beautiful! Where's me fork? For classic pancake turn out, sprinkle with sugar, a squeeze of lemon juice and roll up. Add another sprinkle of sugar and lemon juice on top!! Beautiful!! 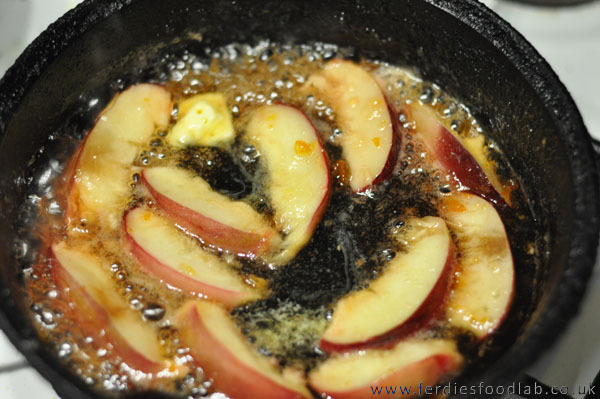 Alternatively add nectarines and syrup, below. 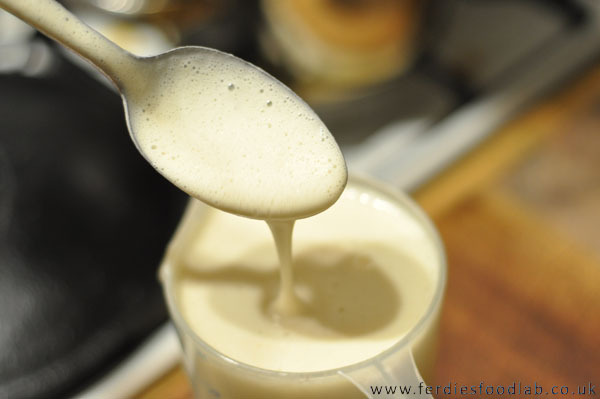 If you're don't have half an hour to wait for the bubbles, leave out the yeast, give the mix a good whisk to get some air into the batter and use immediately! 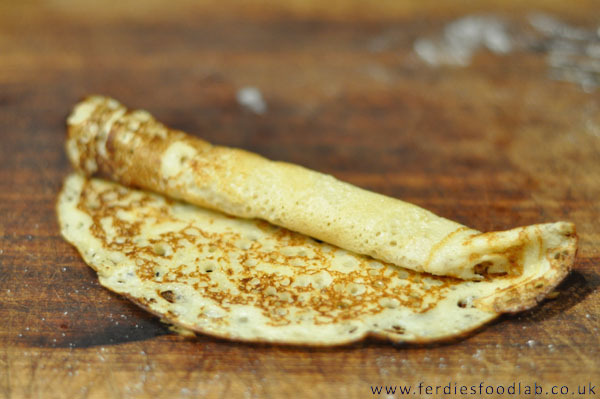 For a thin more crepe like beastie, don't use yeast, but still leave the batter to stand for 45mins to allow the air in the mix to float to the surface and out. 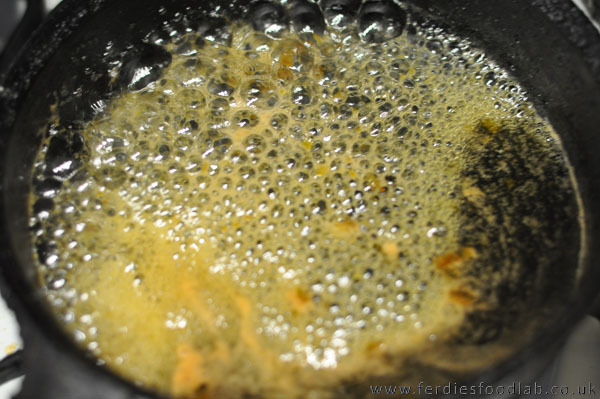 Put the juice and sugar into a heavy-based pan and stir until the sugar has completely dissolved. Bring to the boil, and then simmer until the liquid has reduced by 1/3, then add the nectarine pieces. I used Snowburst because they have a beautiful white flesh and I love their sweet taste. There's no reason not to use normal nectarines though. Put to one side until the pancakes are ready. 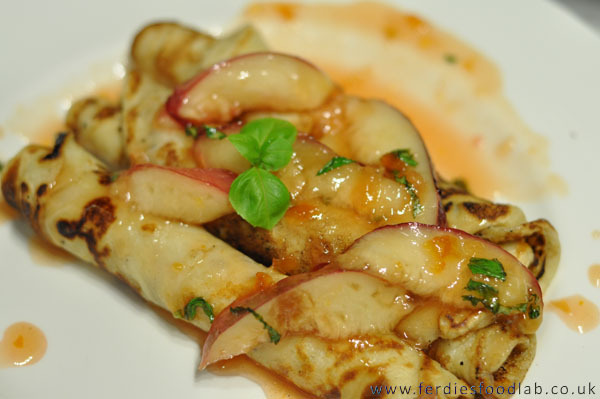 Once the pancakes are plated, pick and fine chop the basil and mix it through the syrup. Then serve. 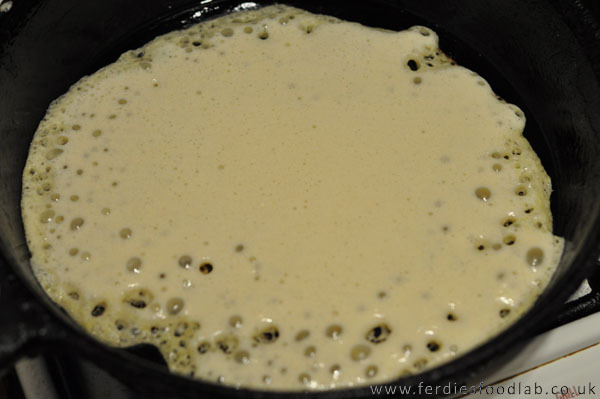 The batter takes 30mins to bubble up so mix it before your favourite soap and let it rise. Make sure you have some warm plates ready to serve the pancakes. Make the syrup before the pancakes, it will keep much better than they will. 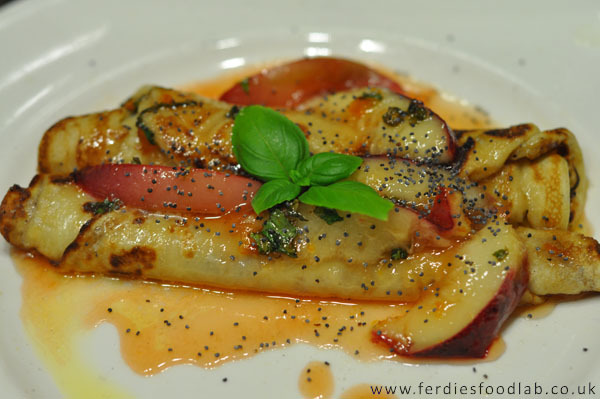 Lay 3 pancakes on each warm plate, spoon on 4 pieces of nectarine, some syrup, dust with a little poppy seed and dress with a basil shoot. I love the crunchiness of poppy seeds, but they're not for everyone! Totally up to you!! Still gorgeous even without poppy seeds!! blueberries, maple syrup, ice-cream, caramel sauce, the possibilities are endless!! 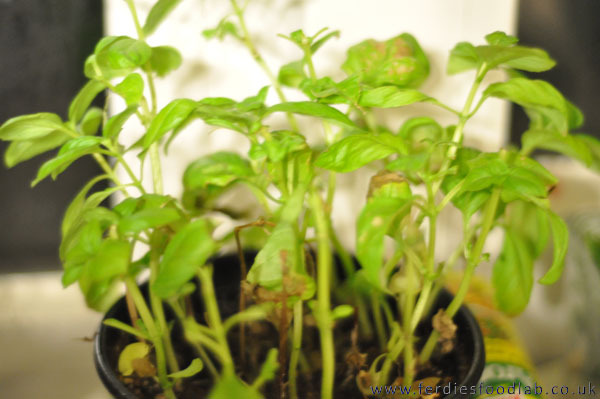 Tip on keeping basil plants alive: Keep them indoors in good light (kitchen window for example), when the soil dries out, put them in the sink and soak them, then drain them and return them to their spot. Pinch off the the top shoots, they'll bush more. Pinch off any white flowers - they'll keep growing longer!! Happy basil! As you can see, I've kept mine alive long enough for it to be almost bald!!! Your wish - you're definitely with the in crowd!! - is my command! Enjoy let me know if you try the recipe, I have to confess I haven't. Next time it rains maybe I'll go foraging collect a few and try it out. Best near streams!